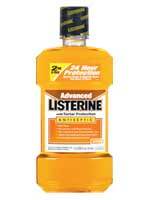 Listerine has a powerful formula that kills the germs that lead to bad breath, plaque and the gum disease, gingivitis. Did you know that even after brushing, there are millions of stubborn germs left in your mouth? These germs build up and form a sticky layer called biofilm that covers every surface of your mouth, and can lead to the gum disease gingivitis. 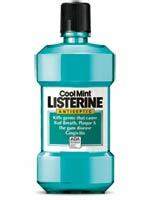 LISTERINE Antiseptic's triple-action formula penetrates biofilm, kills germs, and protects you from plaque and gingivitis for up to twelve hours. 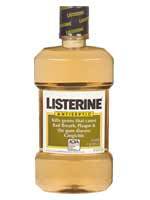 The power of LISTERINE Antiseptic comes from a formula of four essential oils that kill millions of germs on contact. LISTERINE's fixed combination of eucalyptol, menthol, methyl salicylate, and thymol continues to deliver unsurpassed results. No other branded mouthwash has this formula. Biofilm is a more recent term for the bacterial film on your teeth we call plaque. Biofilm is an organized community of germs in a gooey matrix that enables them to multiply and survive inside your mouth. Brushing and flossing help disrupt and remove this biofilm, but sometimes may miss hard to reach areas-prime real estate for gingivitis causing germs. 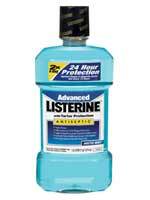 LISTERINE Antiseptic rapidly penetrates the biofilm to kill plaque and gingivitis germs. LISTERINE ANTISEPTIC was shown in a clinical study to reduce 52 percent more plaque and 21 percent more gingivitis than brushing and flossing alone. It is the only nationally branded antimicrobial mouthwash to receive the ADA Seal of Acceptance for fighting plaque and gingivitis. 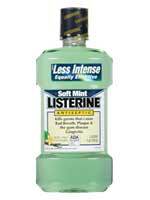 LISTERINE ANTISEPTIC has over 100 years of safe use and 50 years of research, making it the most widely used and extensively researched mouthwash in the U.S.
"The ADA Council on Scientific Affairs' Acceptance of Listerine Antiseptic is based on its finding that the product is effective in helping to prevent and reduce gingivitis and plaque above the gumLine, when used as directed." You know the drill: 1) brush twice a day, 2) floss, and 3) rinse. But occasionally you forget some of these steps. You do many of the things you know are good for a healthy mouth, but you can do better. All it takes are small changes to your routine. Replace your toothbrush every three or four months--sooner if the bristles are frayed. A worn toothbrush won't do as good a job of cleaning your teeth. Keep a few extra toothbrushes--like the REACH TOTAL CARE Multi-Action Toothbrush--on hand, so you can easily swap the old for the new. Visit your dentist twice a year for professional cleanings and oral exams. The more you go, the healthier your mouth will be--and those visits will seem less daunting. Maintain the healthy 1-2-3 oral-care routine: brush-floss-rinse. Make it a goal this week to brush and rinse twice in one day, and floss once. That extra 30 seconds of swishing, with a mouthwash like LISTERINE Antiseptic, will make your mouth so clean and healthy, you'll love the feeling and do it again the next day. 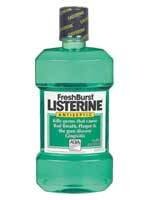 The combination power of REACH and LISTERINE has been clinically proven to reduce gingivitis. If left untreated, gingivitis could progress to advanced gum disease, which emerging science suggests is associated with many other health problems. Use as directed. Brush with the REACH TOTAL CARE Toothbrush and floss withREACH TOTAL CARE Floss.